You and your soul-mate, your bashert, can experience a traditional or non-traditional wedding ceremony in Kona on the Big Island of Hawaii. Dr. Barry Blum and his wife Gloria perform wedding ceremonies for couples whether one or both are Jewish or not. 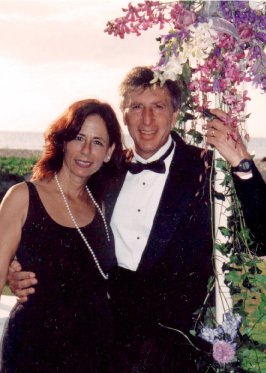 Dr. Blum is a licensed wedding officiant for the state of Hawaii and past president of Kona’s Jewish congregation. What does a ceremony include? The ceremony includes elements from traditional Jewish practice as well as Hawaiian traditions. It is in English and depending on your desires also includes prayers and poetry in Hebrew and Hawaiian and other languages and traditions when requested. A traditional Jewish wedding takes place under the chuppah (the marriage canopy), the vows are in Hebrew, and the Sheva Brachot (Seven Blessings) are recited. At the conclusion the groom breaks the glass. Less traditional weddings may or may not include all these elements. Other customs may also be included, with everything tailored to suit your needs. A beautiful Hawaiian custom that carries profound meaning is the exchange of flower lei. We often include this in our wedding ceremonies. If you’re planning a Wedding Renewal, the exchange of lei instead of wedding rings may be perfect for you. We provide the wedding ceremony and the chuppah, the kosher wine and a glass to break. We will assist you to find whatever else you may need, from expert photography and videography, a Jewish Klezmer Band or a string quartet, and almost every other kind of music (including a Disc Jockey for afterwards for the most up-to-date music from rock to hip hop). We can recommend caterers. And if you want an instant family, we can even bring along a whole congregation of guests to attend and kvell over the bride.